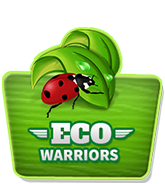 Our new Eco Warriors for the new school year have now been chosen and we are working hard on our first project for the new school year. This year we have started planning a campaign to reduce the amount of children coming to school each day in a car. We realise that too many children are arriving at school by car and we are starting a campaign to increase the number of children walking or using the park and stride initative to come to school. Charlotte McHugh who works for the organisation Living Streets has been meeting with the Eco Warriors each week and together we have surveyed parents to gain their views on travelling to school and analysed these questionnaires. Each morning every child from Reception to Year 6 records how they travelled to school. Those who walk or park and stride twice a week will earn a living streets badge. We are commited to reducing congestion around Springfield Road at the beginning and end of a school day and we hope lots of families will walk or park away from Springfield Road and join us in making this campaign a success.